Our porch swing designs are inspired by old world architecture and constructed with attention to every detail. Each Nostalgic Porch Swing is an individually handcrafted, fine piece of furniture. The deep-seated design provides sofa-like comfort. Then choose stain colors and fabric colors to perfectly accent your home. The swing came today and it is gorgeous! Exactly like the photos but just better because it is oursJ. We love our choice of cushion too. It is wonderful to know that there are still fine craftsmen doing exceptional quality work these days. I think that we have the coolest porch swing of anyone! Thank you. We love it. We got a swing from you several years ago and it's my favorite spot to sit. It is absolutely beautiful. Thank you for making such a quality swing. Thank you so much it is so beautiful! My wife agrees that this would be a great gift. We love the swing. Happy fall! 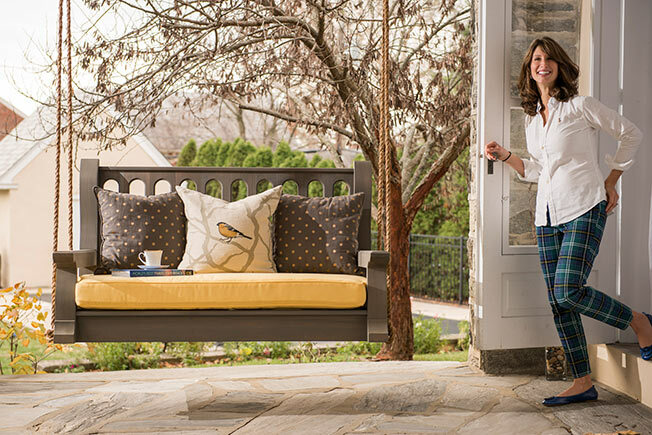 Nostalgic Porch Swings have an enduring beauty that is built to last.